You can force users to provide an answer to a question. This avoids a situation where the respondent can submit a blank response or skip the question. The only exception to this would be if you use Skip Logic within your survey and the rule you set as part of that means a respondent "Skips" the page that this question is contained upon. 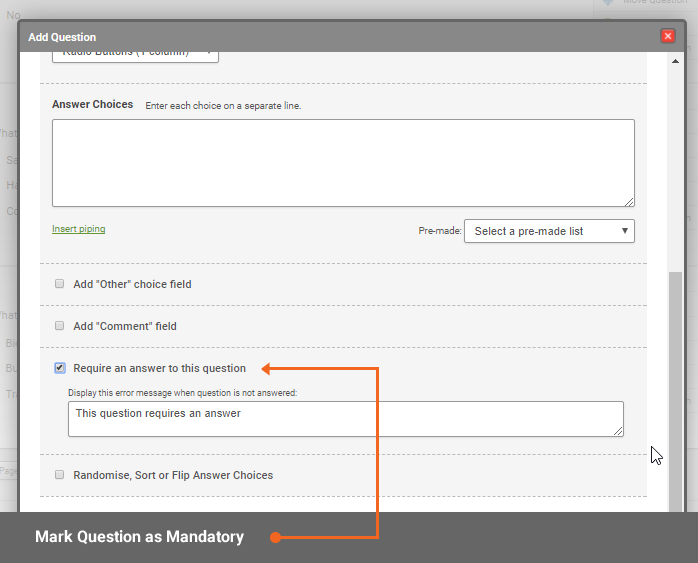 By checking the Required checkbox located to the top right of each question. Within the Add Question or Edit Question popup depending if you want to apply it when you're creating the question or if you wish to add it to an existing question. By marking it as mandatory within the popup allows you to customise the message that will appear when an answer is not provided. In the live survey, all of the Required questions will have an asterisk next to the question text. Test this by clicking the Preview Survey button and navigating to the question you edited. If you have set up a default answer to a question, remember that the respondent will be able to proceed even if they don't change the default selection. The Required checkbox will only prevent them from proceeding if no answer(s) have been selected.